LODI, CA (November 8, 2011) – The largest and most-prestigious karting event is set to take place in just a week and Northern California-based Leading Edge Motorsports is ready to take on the best in the sport. Thirteen drivers will carry the LEM banner in five categories aboard the Intrepid kart chassis brand with hopes of scoring Superkarts! USA SuperNationals XV history at the Rio All-Suite Hotel and Casino in Las Vegas. For the past 12 months and over 15 years of experience, LEM’s Greg Bell has been preparing the drivers and the equipment to score victory and SKUSA Pro Tour championships over the November 16-20 event. Leading the team will be TaG Senior SKUSA Pro Tour championship leader Brett Felkins. Aboard the LEM Intrepid with Leading Edge Power Parilla Leopard, Felkins has been the dominant force in the series. Four podium finishes in four main events, including two wins has Brett well out in front of the championship. The one thing left to cap off a solid season is victory at the SuperNationals. 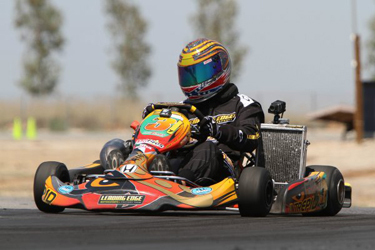 Last season, Felkins contested the KF2 category but was a top-10 finisher in 2009 in TaG competition, so running at the front at the biggest event of the season will not be something new for the Northern California driver. Joining him in the TaG Senior category aboard LEM Intrepids with Leading Edge Power engines will be Mike Graves and Geoff Shaw. Graves is making the move up from the Junior ranks, heading into the deep end with his SuperNationals debut. Shaw is a former LEM team member from a few years back and is making the return to karting, once again partnering up with Greg Bell and Leading Edge Motorsports. The other driver carrying the Leading Edge Motorsports banner in the Pro category is Nick Lucido. The Texan is competing in the S1 Pro Stock Moto category aboard an Intrepid. Running a partial schedule on the season, Lucido’s best result this year was a top-five finish at the prestigious Rock Island Grand Prix King of the Streets event in September. Looking to gain that extra advantage, Lucido will work under Bell’s guidance for SuperNationals glory. Leading Edge Motorsports will head to Vegas with a stout S2 Semi-Pro Stock Moto roster. Jared Woolf will lead the team as the reigning ProKart Challenge North class champion. Woolf drove to two feature wins and two runner-up finishes in six races aboard his LEM Intrepid with a Leading Edge Power Stock Moto. Mexican driver Mariana Ramirez is coming off her best results of the season heading into Las Vegas. Ramirez finished a strong fourth place finish at the recent Streets of Lancaster Grand Prix Pro Shifter category. While her SKUSA Pro Tour campaign has not been as successful, Bell feels they have put the right pieces together for her to end the year on a high note. Joining them will be the Diede brothers of Cody and Troy. Both drivers have shown the speed to compete with the best in the category. Cody finished a strong third place last year at the SuperNats while Troy place seventh during his debut S2 weekend in Grand Junction back in July. The TaG Master duo of Randy Froom and Paul Hohlbein will represent LEM in the category for the SuperNationals. They finished the ProKart Challenge North program third and fourth, respectively, in the point standings and were top-10 performers at the opening Pro Tour event in Tucson. They will be joined by a former SKUSA standout and former LEM driver Trevor McAlister. ‘T-Mac’ is a former two-time winner on the SKUSA ProMoto Tour with Bell during the early years of the organization aboard a shifter kart. Returning in a LEM Intrepid with Leading Edge Power Parilla Leopard, McAlister will attempt his first start at the SuperNationals in over 10 years. The LEM Junior squad will see two drivers competing at the SuperNationals - Brennan Mankin and Jarred Campbell. Both drivers are coming into the Vegas event with success on the year. Mankin started a limited number of races on the year, scoring a win in ProKart Challenge South and North programs. Campbell raced just one SKUSA regional race, scoring a victory at the Prairie City round of the North series. The duo will each have LEM Intrepids with Leading Edge Power Parilla Leopards with Bell making sure they are ready for the challenging temporary circuit. Leading Edge Motorsports will be working directly with Intrepid North America, the chassis brand importer for United States and Canada. Under the tent will be a number of drivers from Canada and other surrounding countries as well as Intrepid/Praga factory drivers - including 2009 SuperNationals SuperPro winner Bas Lammers and female standout driver Beitske Visser. A number of the Intrepid North American TaG Senior and Junior drivers will be competing with Leading Edge Power engines, all developed by Bell himself.